Volunteer - Come Join the Fun! We are building THREE homes in Princeton beginning 2017 into 2018! 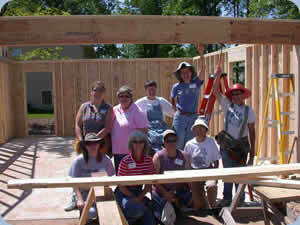 BECOME A VOLUNTEER for the spring and summer builds! * Scroll down for details. CONSTRUCTION SITE SUPERVISOR FOR PRINCETON! The Site Supervisor directs the construction of these homes from start to finish. Needs basic knowledge of home construction but need not have ever built a home. 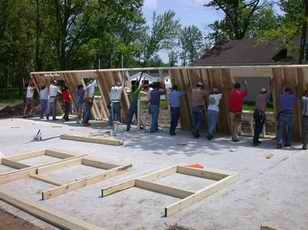 ECM HFH has experienced building committee members that are always available if problems arise. Does require ability to read blueprints. Construction Site Supervisor need not be on site every day - being able to rely on the Site Coordinator to keep the project going in his/her absence. Will coordinate the work crews and get them signed in daily, will assist the Construction Site Supervisor in ordering materials, will usually open up the tool shed in the morning and lock it up at night. Need not be on site at all times. This person may get involved in the construction, but it is not required. 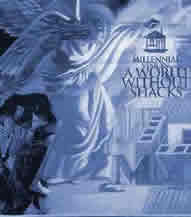 Will work with community groups, churches, etc. to plan for lunches for the volunteers. May raise funds to provide for lunches. Arrange for community events for visiting volunteers. May occasionally wish to speak to groups about the Habitat for Humanity program. This position will only take a few hours per week to perform. We respectfully request the assistance of community groups, churches, etc. to plan for lunches for the volunteers. We deeply appreciate the raising of funds to provide for lunches. Volunteers of every skill level ARE NEEDED! Come join the fun. Call us at 1-866-600-0288.